With Autumn now in full swing, I finally have the chance to share one of the real highlights of my summer – designing the interiors for a fabulous holiday home in Devon. 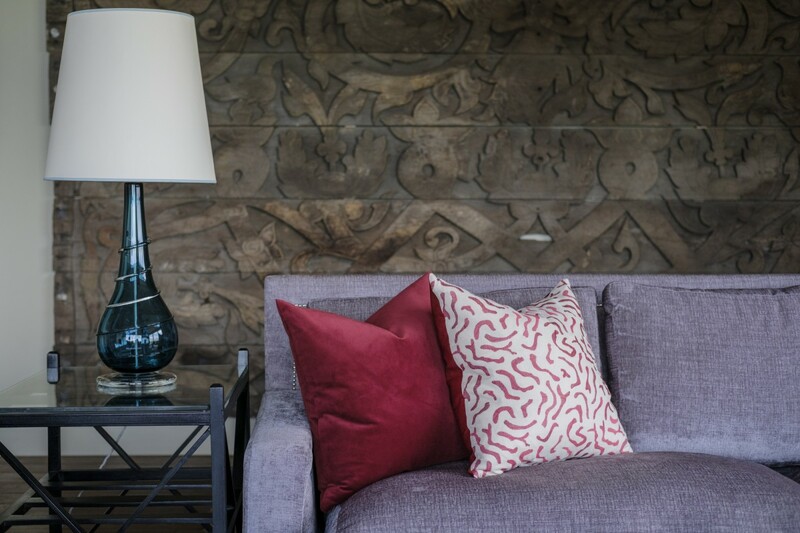 If you have a holiday home that perhaps needs a revamp, or are thinking of investing in one, I hope my experience will give you the inspiration you need to get going on what should be an exciting and rewarding interiors project! 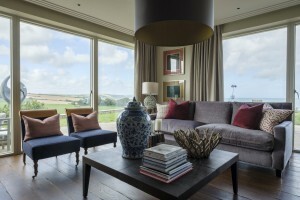 To set the scene, Golden Meadow is a six-bedroom property in Torcross, with panoramic views across Start Bay. With the interiors set against the backdrop of such fantastic scenery, I knew a bold approach was needed! 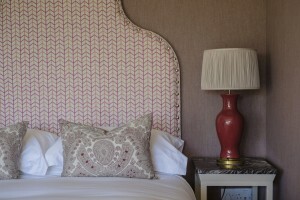 I was keen to introduce what I would describe as a fresh, modern – yet quintessentially English – style throughout. Essentially, I was aiming for that ever-elusive combination of the contemporary and homely and I think we managed to achieve just that. It may sound obvious, but walking from room to room as you imagine how your guests will be using it is the best starting point when designing an interior scheme. This will inform everything from lighting to how you arrange the furniture. Keep your space open and accessible and, if you have a focal point (which might be a statement rug, a prized ornament or dramatic piece of artwork) then think about how your furniture is placed so that everyone in the room can fully enjoy this. A great way to give your interiors a modern refresh is by tapping into the current trend for using combinations of colours and patterns, which also adds that warmth and cosiness needed to help guests feel at home. 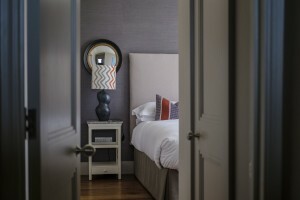 I used this mix and match approach to give every one of the six bedrooms at Golden Meadow its own unique personality. 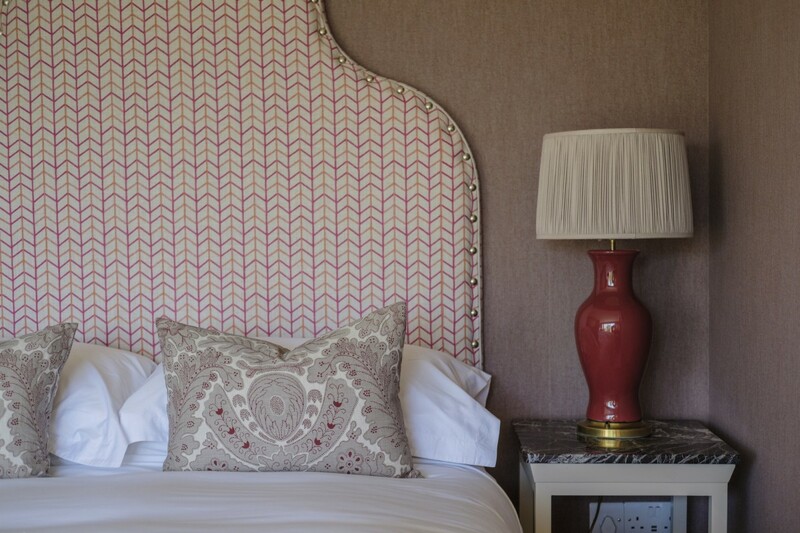 This meant using different textures through wall coverings, bed linen and upholstery and opting for a variety of colour combinations. Readers of my blog will know I’m a huge fan of bold, dark colours and Golden Meadow is a great example of how they can be introduced to good effect. For instance, I used an interesting dark wall panelling along one wall to inject both warmth and character to the living area. 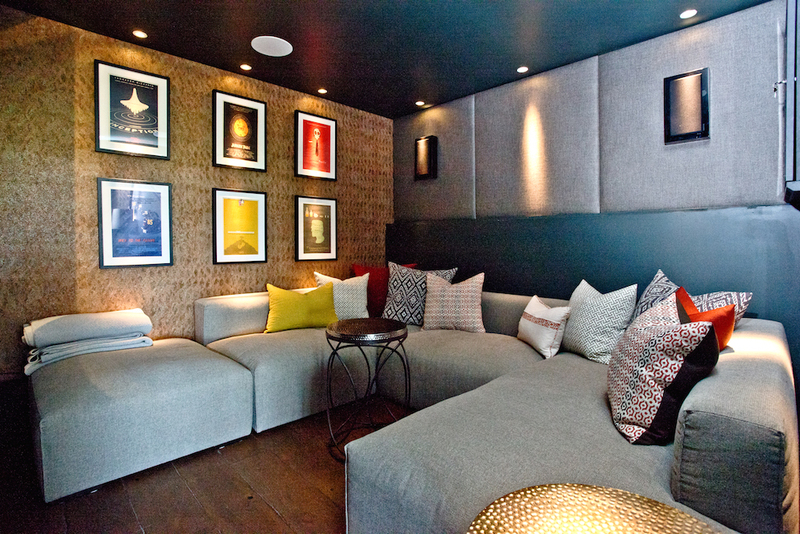 Naturally, the cinema room featured a particularly dark décor, but pops of bright colour from wall art and patterned cushions, together with subtle, warm downlighting, added to the sense of cosiness we were trying to create there. While we’re on the subject of lighting, lamps and subtle uplighting are both tried and tested ways to make living spaces feel bright and welcoming, without being too harsh. If you can find an interesting variety of lamps, all the better! When designing interiors for a holiday home, it’s important to avoid stamping too much of your personality on the décor. After all, all kinds of guests with all kinds of tastes will hopefully want to stay, so do all you can to help them easily imagine themselves at home there. 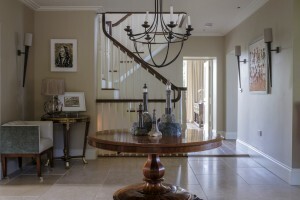 However, this doesn’t mean your home should be completely devoid of personality! 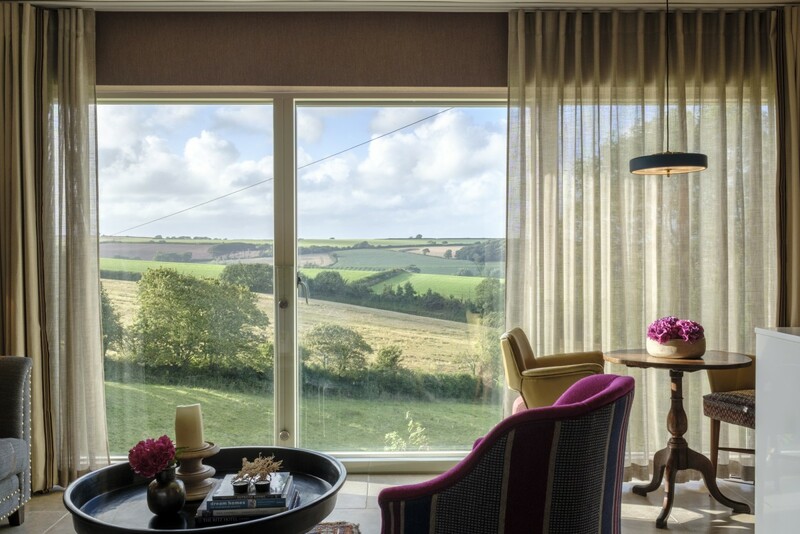 At Golden Meadow, we incorporated some of the owner’s existing furniture and accessories within the new scheme we created to add a personal touch in a subtle way – reminding guests that this is a home, but one they can easily make their own for the duration of their stay. We all know how quickly homes can clutter up, so give your guests plenty of places to store those everyday items that can end up scattered everywhere, obscuring the finishing touches you’ve worked so hard to create. At Golden Meadow, the utility room shoulders much of the burden when it comes to storage, but tasteful wall panelling – and attractive coat hooks that match the bench below – all add to the overall homeliness of the property. It’s too easy to treat utility areas like an afterthought and just a few changes can make a big difference. Last, but by no means least, remember to think about how your finished scheme will come across in photographs for those all-important websites, brochures etc. If you find it hard to visualise, take some photos yourself when you’ve got everything in place – if there’s something that doesn’t look quite right, it will really stand out when photographed. With a stay there recently featuring as a competition prize for fans of clothing brand Joules, word is set to spread fast!